I am happy to report we have a quiet week at home this week. There’s a few events on the calendar, though nothing too hectic to worry about. Part of my relaxed attitude is thanks to the time I spent on the menu plan, my recipe lists, and running a few errands. Keeping all the items we need in ZipList on my iPhone is proving to be extremely helpful. My next step is to include my stores in ZipList though I don’t consider it a priority right now. However, I do consider updating my price book a priority. I went through several months of receipts and updated the Price Book I’m keeping on Google Docs. I’ll be sharing the current lists tomorrow. My goal is to reduce our grocery budget (as always) and to use the lists to organize my grocery shopping. I’ll know ahead of time where I can find something and how much to spend. I can plan a month’s worth of grocery shopping accordingly instead of running to the store at least once a week. Once a Month Shopping is not my goal. My goal is to have a plan for the month and make the best use of my time and our money. This past weekend, I went through my old Home Management Binder and pulled out old lists of main dishes, side dishes, etc. that we like and combined them with new lists I printed from ListPlanIt. I talked to the kids about snack ideas. I’ll use their suggestions to plan a snack making session for the freezer and to add to my food shopping list in ZipList. I use my modified 3 x 7 weekly menu plan which is now part of my Home Management Binder. My recipes are on Frugal Local Kitchen, including a round up of Meatless Dishes for Lent. Disclosure: To help pay for running this blog, I am an Amazon Associate and a ListPlanIt Affiliate. March 1st sounds great, I love homemade pizza. I would love to be this organized! I’m coming to your house! I love that you make snacks! 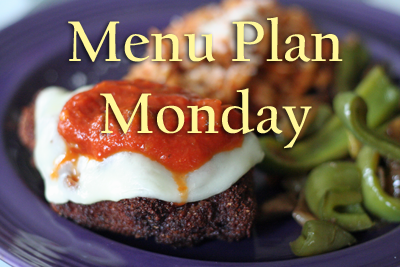 I’m stopping by from Organizing Junkie’s Menu Plan Monday today for a blog visit. Looks like there’s going to be some delicious meals this week at your house. This gal is always looking for recipe ideas and inspiration. Thanks for participating in MPM! I totally want to try those gluten free blender brownies!